LONDON - The UK should speed up preparations for the rise of electric vehicles, according to the chief executive of ABB, the world’s largest supplier of fast-charging points. Speaking as the Switzerland-based engineering firm became the first official sponsor of the electric street racing series Formula E, Ulrich Spiesshofer predicted a flood of consumer take-up of plug-in cars. And he added his voice to warnings that Britain must move faster to make sure owners of electric vehicles are not stymied by a shortage of charging bays. “E-mobility is unstoppable, it’s just a question of how fast and how deep it will be deployed,” he said. He said this would include adding to the UK’s network of electric charging points, as well as ensuring enough energy capacity. There are 14,344 charging connectors in the UK, according to ZapMap, which charts the scale of the UK’s network. Those charging points served around 132,000 plug-in vehicles at the end of 2017, but the National Grid has predicted that the number of electric cars could surge to 9m by 2030. “In the next couple of years, it’s in the interest of everybody to make sure the infrastructure is coming up,” said Spiesshofer. He welcomed the government’s budget pledge to spend £400m on improving the UK’s charging point network but warned that the power grid also needed to be ready to meet the increased demand. Electric cars have been forecast to add about 18 gigawatts of power demand to the grid, the equivalent of six Hinkley Point C nuclear power stations. 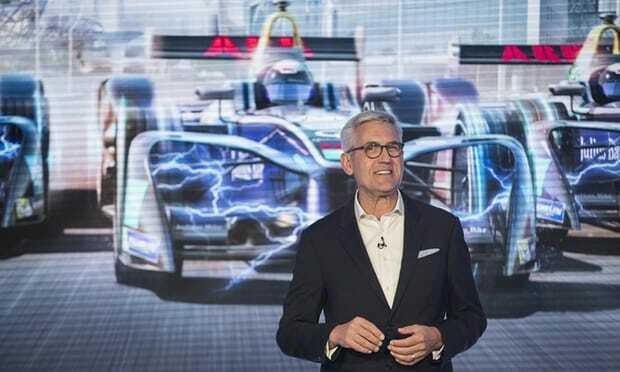 Spiesshofer said he hoped ABB’s sponsorship of Formula E, which will last until 2025, would help spur interest in electric cars and lead to technological breakthroughs.